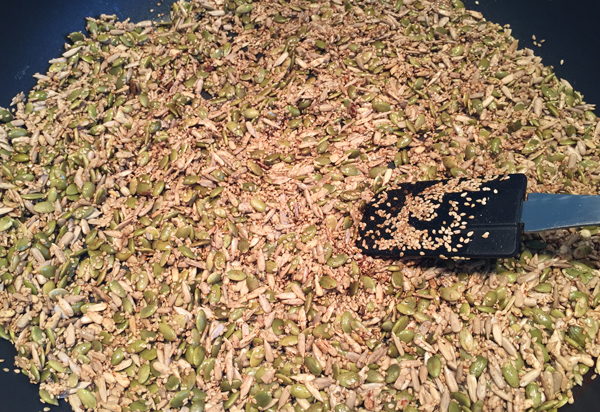 Do you keep pan or oven roasted seeds ready for use? I find them so useful! I often dry pan roast them, but it’s fun to play with recipes. Here’s my latest batch, using a little oil and some spice. It’s not sweet, because of the volume of seeds, therefore they can be used in both savoury and sweet recipes. If you’d like a sweeter version, you could make two ‘half’ batches – one to the recipe below and one with added cinnamon. Melt the coconut oil in a large pan. Add the cinnamon and stir in thoroughly. Add all your seeds to the pan and slowly cook them on a low heat so they don’t burn. Keep an eye while you stir and turn them, ensuring the seeds cook evenly. When the seeds have coloured nicely (you’ll know when the pumpkin seeds are ready – they make a popping sound when they become crunchy and jump out of the pan!) remove from the heat and allow to cool. If you’d like to remove any excess oil, leave them to dry on kitchen paper in a wide bowl. Once they reach room temperature, move them to an air-tight glass jar. I use a huge risotto pan to make a batch this size. Halve or divide the ingredient list by 4 and make a smaller batch if you don’t have a big enough pan. Look out for the next post. I’ll be sharing a hummus using some of this batch!